It seems that this car was built to prove to the world that Aston Martin is more than just sponsors of Red Bull Racing, they’re technical partners capable of winning races at the weekends and producing cars like this during the working week. 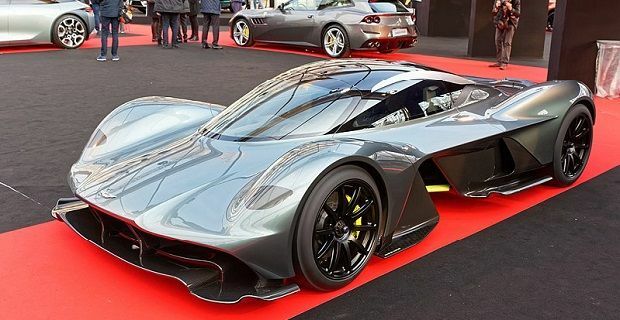 Say hello to the new Aston Martin Valkyrie. This car looks like the sort of vehicle that’s unlocked on a video game but believe us when we say that this Aston Martin is the real deal. The first collaboration between the F1 constructor and the British car marque was designed by none other than Adrian Newey which is why aerodynamics rather than aesthetics shape the car. The open underfloor alone produces 4,000lb of downforce at speed and the wheels, which have race-spec centre-lock wheel nuts to reduce mass, are designed to maximise airflow. Neither the carmaker or the F1 constructor have revealed too many facts about the car which won’t hit the road until 2019 but we’ve learnt that it will top out at 225 mph and weigh 1,030 kg meaning it will have a better than 1:1 power-to-weight ratio. The track version has an even more aggressive look than the road car but Newey wasn’t going for style when he penned this monster, of which only 25 will ever be produced. The AMR Pro is capable of handling 3.3 lateral G-forces in the corners and 3.5 G under braking. With minimal silencing, the car’s exhaust will be allowed to ring out the tune created by the 6.5-litre engine. Although the track-focused AMR Pro utilises the same V12 engine as its road-going cousin, Aston Martin promise a 250 mph top speed. Carbon brakes and 18-inch wheels, which are smaller than those on the road car so that Michelin’s LMP1 race tyres can be fitted, add to the car’s racing credentials. Those looking for comfort should buy the other Valkyrie as the interior heaters and infotainment screens are removed from the track version. While only 25 AMR Pros will be sold, availability of the road-going Aston Martin Valkyrie will also be restricted. Just 150 examples will be produced of a car that continues the British marque’s tradition of making its high-performance cars with a “V” as is the case with the Virage, Vanquish and Vulcan. The letters in the type name of AM-RB 001 refers to both Aston Martin and Red Bull and the numbers seem to suggest that the two firms will work together again on other projects as this car’s numbered 001. The car will be built by David King’s team who operate in the purpose-built facility that produces 77 examples of the Aston Martin One-77 between 2009 and 2012. This machine will be a hybrid so its main competitors will be the Mercedes-AMG Project One, LaFerrari, Porsche 918, and McLaren Senna. Although its price won’t be a factor for its buyers, it sells for £3 million, which is a fair bit cheaper than the £5.7 million you’ll need to buy LaFerrari but three times more expensive than the McLaren Senna. Buyers won’t be able to buy and sell the car on for a quick buck thanks to Aston Martin’s “flip policy” which the firm’s President and CEO, Andy Palmer, revealed on Twitter. If a buyer bought and sold the car on for a quick profit, the will be blacklisted and will not be allowed to buy any future special editions produced by Aston Martin. That policy has worked well for Ford with their GT so it should work equally well with the Valkyrie.